It is 1483, and Sir Thomas Lemuel Hawke, a Cornish knight, is about to ride into battle. On the eve of his departure, he composes a letter to his four young children, consisting of twenty virtues that provide instruction on how to live a noble life, and on all the lessons, large and small, that he might have imparted to them himself were he not expecting to die on the battlefield. "Why am I alive? Where was I before I was born? What will happen to me when I die? Whatever well our lives are drawn from, it is deep, wild, mysterious, and unknowable..." Rules for a Knight is many things: a code of ethics; an intimate record of a lifelong quest; a careful recounting of a knight''s hardest won lessons, deepest aspirations, and most richly instructive failures; and an artifact, a relic of a father''s exquisite love. Drawing on the ancient teachings of Eastern and Western philosophy and religion, on literature, and poetry, and on the great spiritual and political writings of our time, Ethan Hawke has written a parable that-in the story of a young man''s journey toward a life of authenticity and meaning-captures the instinctive movement of the heart toward truth and beauty. 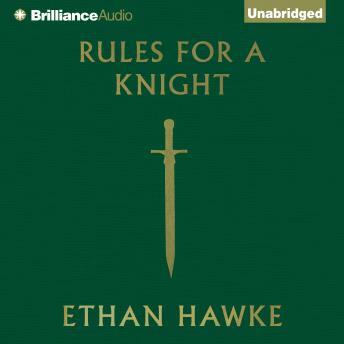 Rules for a Knight has the appeal of Arthurian legend; the economy of Aesop; and the vitality, intelligence, and risk-taking that could only emanate from Ethan Hawke.